An interesting and relatively easy to understand graphic is included on page two of the report, which I have included below. In regards to the developments in technology, I can easily see the predicted timelines playing out, as many schools have already joined the vast number of early BYOD adopters, with my own school in the process of adopting it. Makerspaces are also something that has seen a large number of early adopters both within Australia and internationally, . 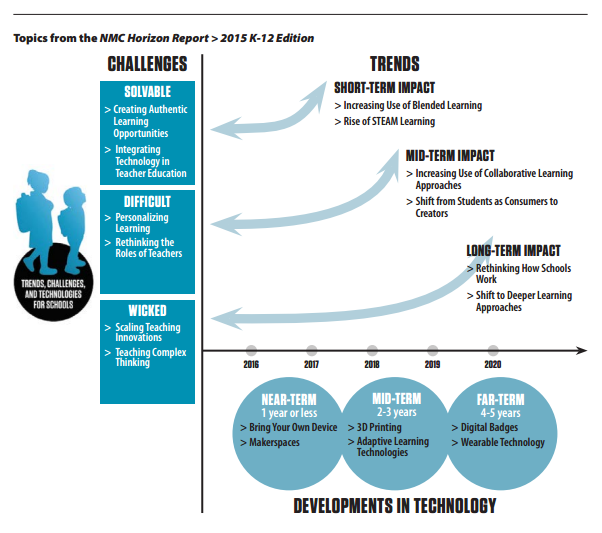 Posted on August 18, 2015 November 13, 2015 by Brendan MitchellPosted in Digital Pedagogy, Education, EduTechTagged ClassTech, education, Horizon Report, NMC Horizon Report, technology.